The morning show of one of San Antonio’s top radio stations, KTFM 94.1, is now being produced by Palo Alto College alumni Rossi Ramirez. After graduating from Harlandale High School in 2009, Ramirez began her journey at Palo Alto College. Initially she pursued a career in the medical field as dental hygienist. However, those plans swiftly changed after she took an Intro to Mass Communications course. After that course, Ramirez changed her major to Advertising/Public Relations. She made good use of her time at PAC, attending a summer course in New York City and Washington, D.C. Although Ramirez had a wonderful experience at PAC, her original plan was to attend Texas State University in San Marcos, but she chose Palo Alto instead. “I ended up going to PAC because of family issues. I couldn’t afford it out of pocket and didn’t want to take out any loans, so I decided why not try the two-year thing,” she said. Not only did Ramirez benefit financially from attending PAC, but she also appreciated the college’s small, one-on-one classes. She received her associate’s in Advertising/Public Relations from PAC and transferred to Texas A&M University-San Antonio. While studying at TAMUSA, Ramirez progressed through several internships with WOAI-TV, San Antonio Living Lifestyle/Entertainment Show, KABB-Fox 29 Daytime at Nine and Univision Communications. She graduated with a Bachelor of Arts in Journalism/Broadcasting in May 2014. Today, Ramirez wears many hats working for Alpha Media Broadcasting here in San Antonio. Alpha’s stations consist of KTFM, La Ley, Norteño, KZDC ESPN San Antonio, and ESPN Deportes. She is the producer of the “Blondie and Nugget Morning Show,” the videographer for all five stations, and a recent addition to the morning show as a radio personality. 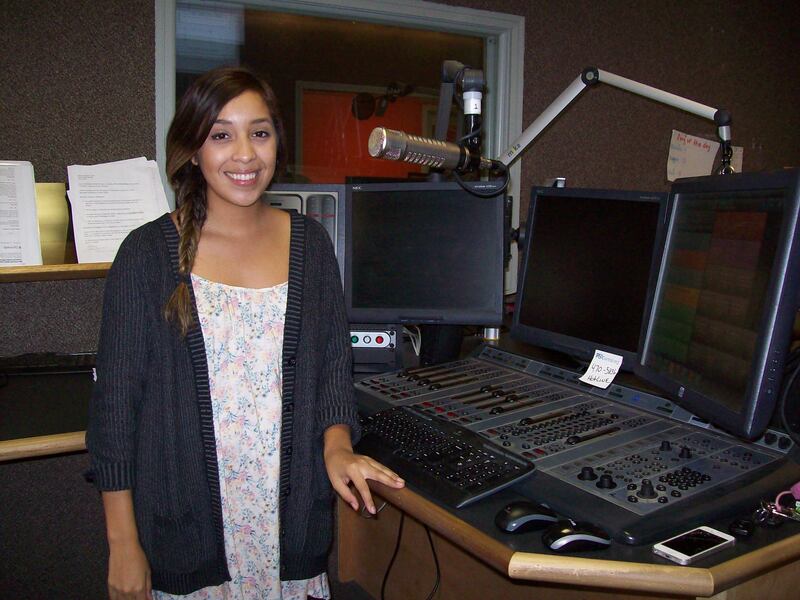 You can hear Ramirez along with Blondie and Nugget weekday mornings from 6 a.m. to 10 a.m. on KTFM. Although she is enjoying herself, Ramirez plans to leave San Antonio for a bigger market like, Los Angeles, Miami or New York, at some point. One day we will see Ramirez on our televisions, interviewing A-list celebrities on the red carpet. Rossi Ramirez is a true Palo Alto College success story with only more to come.